Southern Thailand is bracing for more floods after at least 15 people were killed following heavy downpours. Thailand's weather bureau said torrential rain was expected for a couple of days over much of southern Thailand. The navy has helped evacuate hundreds of tourists left stranded in the region, many of whom will be contacting their travel insurance provider to report their losses. Torrential rains caused landslides in the Krabi province, killing at least four people and leaving more than 100 injured and dozens missing. The death toll is feared to be much higher as rescuers found it difficult to access some of the seven villages hit by the landslides while most of the region's telephone service has been cut off. Vittayen Muttamara, deputy director of the government's flood centre, said many urban and rural areas were inundated, and connecting roads blocked by mud and rock slides. 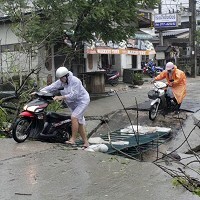 Tourists left stranded in resort islands such as Koh Samui, where air traffic was disrupted due to flooding around its airport, were evacuated by Thai navy vessels. Prime Minister Abhisit Vejjajiva who visited the region, ordered residents to be evacuated from all areas at risk.